Yeah, book-case emptied, stuffed animals flung, toys and their respective parts strewn about. All because I didn’t take my girls to McDonald’s. This whirlwind struck while I was making lunch. That would be a home-cooked soup and handmade egg salad sandwich lunch. So technically, this is what I get for making my girls lunch. If we had gone to McDonald’s, someone else would’ve worked on the food. I would’ve monitored their behavior and the storm would’ve never touched down here. 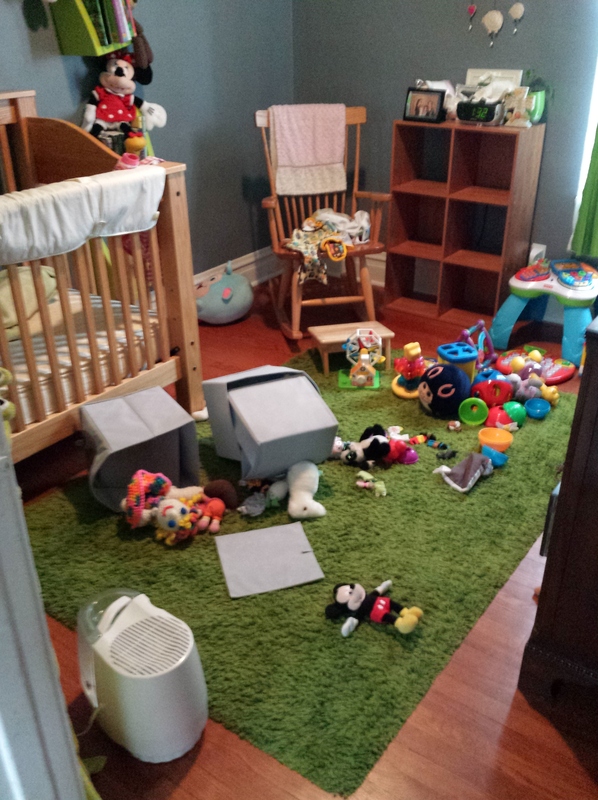 Now this isn’t some rant post about the destructive nature of a toddler (times 2). This is more of a notice to new Dads and potential Dads-to-be. The point of this post is to send home this message: sometimes you need to be away, you need to leave your kids “on their own”. That’s right, sometimes you need to go downstairs to change over the laundry. Sometimes you need to hole up in a room to clean. Sometimes you need to go to the bathroom…without an audience. Sometimes you need to prepare a meal. So figure out how to do it wisely. Make sure rooms are as safe as they can be (like using outlet covers). Make sure you know the sounds of “normal” kid activity, and stay aware of silence (the telltale sign that something is going on). Try organizing an activity before stepping away. Try making a game where you can pop in and out of the room so you can keep tabs, but still accomplish a task in another area. And for goodness sake, try to keep your absence to an absolute minimum. So again, to the new Dad or soon-to-be Dad, some parting wisdom: keep the messes in perspective, they come with the territory. So much of parenting is a juggling act, just keep trying and learn from the day’s adventures. And sometimes take the kids out for lunch. 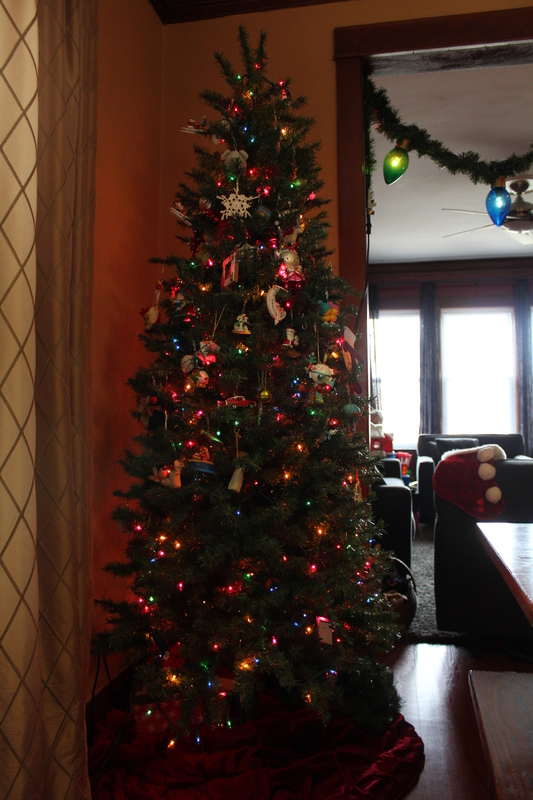 We have had our tree up since the day after Thanksgiving, so I figure it’s time to share. Yes, it’s an artificial tree. But it’s pretty, no? We think so. Before you beat me up in the comments, let me point out what is most obvious: only the upper half of our tree is decorated with ornaments. For those of you out there who are “parents of toddlers”, the reason for this is obvious and necessary (as it turns out, pet owners will also recognize this style of decorating). To the unenlightened, let me share with you the magical attraction that ornaments possess. Much like all things sharp, electrified, high up or generally dangerous, ornaments emit a siren call to human beings shorter than four feet tall. So the entire tree was decorated. But as grabby hands explored the lower branches ornaments moved up. So I share this in solidarity with my fellow parents, and put it out there as a general warning to would-be parents. Have a Christmas tree, or any holiday decorations for that matter? Prepare to put them much higher than your pre-toddler levels. They just want to touch all the ornaments and play with them and remove them from their assigned branches. I am not really sure how many installments of Christmas adventure I’ll end up posting here. The D-3 Christmas Preparation and Survival Guide is very much a work-in-progress. Stay tuned for our next post though – toddler holiday cards! Creating a genius-Fathers’ Reading Matters! Maybe I’m exaggerating a bit in the title here, but I’m pretty stoked out on an article that I recently read. Steve Kilpatrick, a National Representative for the National Children’s Study, wrote about research studies that highlight the importance of fathers reading to their children. He points out that the studies find “Fathers’ reading matters for children-A LOT!” And how much reading are we talking about? Just 20 minutes a day. As a quick aside, I am sure that when mothers read to their children it is also important. But I’m pattin’ my Dads on the back tonight. Kilpatrick cites three specific studies. The first, from America, found that fathers boost their child’s expressiveness and language development when they read to them regularly. Again, just 20 minutes a day. A Swedish study found that when fathers read regularly to their elementary-aged girls, it helped to prevent depression and improve their mental health later in their lives. In Britain they found that when fathers read regularly to their school-age children the child’s reading level advanced faster than children whose fathers only read them once a week. So this is all a bit heady…what’s the point? The point is that reading with your kids is great for them. It boosts their mental development and improves their mental health. Overall, it sounds like reading to children helps make them into well-adjusted, competent little people. Sweetie and I spend hours reading together. From Highlights to Frog and Toad, Dr. Seuss to Shel Silverstein, she loves sitting together to read a book. And it has been fun to watch people gifting her books that they loved when they were kids (Captain Jack is especially good at that). Steve Kilpatrick also points out that any Dad who has read with his children knows “how wonderful those moments are!” So that’s good news and a little boost to all the Dads out there, not just the “Stay-at-Home” ones. Know that time spent with your child in a good book counts in so many ways. And just in case you don’t have any good books lying around, let me humbly recommend Nelly Gnu and Daddy Too by Anna Dewdney. Sister Scales-of-Justice gifted this to me for Father’s Day and we have read it no less than 80 trillion times. No llama drama there, just more with the exaggerating. Take a break from that Project, Dad. Get out from behind this computer, or put down the phone/tablet etc. Go read to your kids knowing that you are doing something that is great for all of us. Here’s a little gem that has proven useful around our house. I hope it gives some respite to those of you out there attempting to communicate with a toddler. Sweetie is just about two-and-a-half years old. A while back, about eight months ago, she went through a gnarly and thoroughly frustrating biting period. No big shock, many toddlers experiment with biting. Wife did some online digging and found a method for diffusing the situation by re-directing the child’s behavior with an “instead of” scenario. When Sweetie would make like she was going to bite Wife would tell her, “Instead of biting Mommy, why don’t you give me a kiss?” I was a skeptic at first, and it took some getting used to, but we saw good results quickly. And got a lot of kisses. As we have moved into the full-blown, second-year-of-life toddler existence I have applied this re-direct to just about everything. If Sweetie throws a fit over eating, I give her an “Instead of getting upset, let’s just take the bite.” What? She doesn’t want to stop playing to pee? “Instead of arguing about going to the bathroom, let’s just go real fast and get back to playing.” And it is working well enough that I thought I should share it with the rest of you (like 8 times out of 10). Some of you out there probably already know this parent mind-trick. That’s great, just give me a “Duh” in the comments section. Others might point out that the “instead of” re-direct provides the child with an option, a choice. This empowers the child to exercise their agency in a situation while still reaching the parent’s goal. You can fill the comments section with heady child psychology type stuff. For those of you that might need this tidbit, please try it. You can leave your success stories in the comments! That’s all for now. I will continue to share as we see successes in our house. Please feel free to do the same – I can always use the help! I found these notes while going through some things the other day. Written back in November they are just as relevant today – now about a year in to this detour (and there’s a whole different entry!). I find that my days are filled with little reminders that I am not in control of many things. 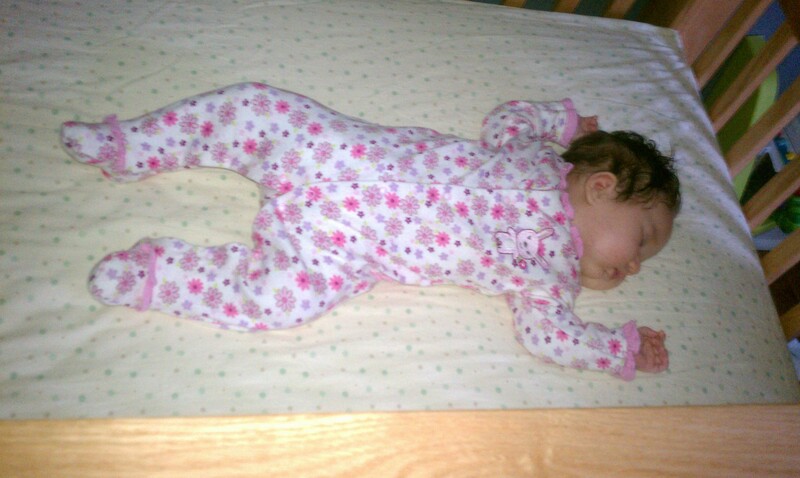 Despite schedules, Sweetie sleeps when she is ready. Despite standard mealtimes and seemingly delicious food, Sweetie eats when she is ready. After days filled with unwarranted crying, Houdini poop that escapes from diapers, games with three minute entertainment value and countless other moving targets I needed something to pin down. So much of care giving is organic and like life in general, things are constantly moving and changing. Just like trying to influence the “input variables” at my previous employment, I tried to find something that I believed I could control. The answer came in the day-to-day chores around the house, in particular, the laundry. Well, not just “the laundry”, but specifically the towels; and not just any towels, but particularly the bath towels. I found that if I folded all of our bathroom towels in a particular way that they all took on the same size. When they were the same size then they all stacked in same-sized units. And those units stacked neatly on the shelves designated for the towels, even where they shared the shelf with the sheets. It doesn’t describe well, but here goes: in half lengthwise, then in half lengthwise again (making sure the decorative stitching shows), then folded in thirds from the outsides in. I found that this folding method did not work when Sweetie was awake and “helping” me with the laundry. That usually goes “fold one, chase two, re-fold one, chase child, repeat”. So I started folding the towels during her nap times. And I found that it was just me quietly folding towels. This became my thing, my little neurosis, and one aspect of my life that I can control. I demand a particular fold, I work on it until it’s correct and I deliver my little bundles to their shelves. I change the towels on the same day each week. And I hang the fresh towels a particular way on their bars. These activities are simple accomplishments, small victories (and sometimes the only ones in my day!). I also found that once I set up this routine I was able to process while I was folding, shelving and hanging. I solved small problems, worked out home projects and planned meals. Focusing on something so common helps to ground me and definitely gives me back a sense of control. And focusing on something so UN-important helps me maintain perspective. I am better able to sort out the battles I will fight. Without sounding too esoteric, I think of it as a type of meditation on my day. Yes – a meditation while folding bath towels. I don’t think this is a unique experience. I bet that plenty of you also have a little neurosis that helps you find a lot of sanity. I definitely don’t think it is as strange as it first seemed, and I highly recommend looking for it. Now it is part of my routine, and an important part at that. I completely acknowledge that having your towels folding a particular way is neurotic, but it is also nice. And on the rough days it is good to have something solid to fall back on. Hopefully it’s also going to help me prepare for the future. Sweetie is just as human and just as fickle as the rest of us. She is bound to stray from the standard and do her own thing. I don’t know how much the towels will cool my temper when she breaks curfew and comes home at a late hour, but I like to think that they will help keep me centered on what is important. After two days with marathon naps I was inspired to write about Sweetie’s sleep habits. Momma Z and I were recently comparing notes about how the girls’ sleep and at one point she asked straight-out, “So how did you get her to do that?”. “That” meaning nap twice a day and sleep from 7:30PM to 6:30AM (roughly since the 6 month mark). The short answer is a sleep schedule – a firm sleep schedule. The long answer starts at the hospital the day after Sweetie was born. Nurse Rita worked on the recovery ward at our birth hospital and taught the new parent class. She was a gentle but firm “whisperer” able to calm a crying child with a few words spoken directly. She had a couple of simple steps to teach your child how to sleep well. Nurse Rita said our first job was to wear our children out so they are ready to sleep at bedtime. We quickly experienced the truth in this step, seeing that if we did not sufficiently entertain Sweetie while she was awake, then she would wear us out when we tried to put her to sleep. 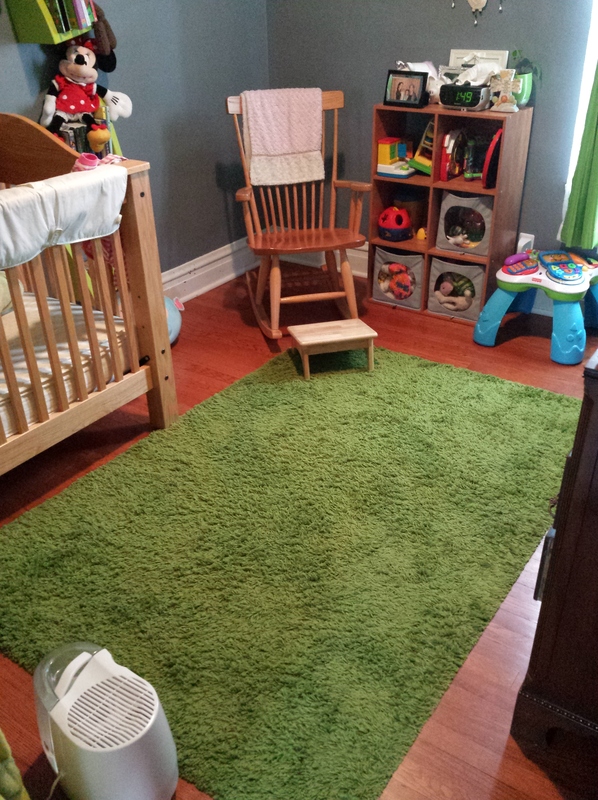 Next Nurse Rita encouraged setting up and following a schedule to get your child in a routine. We went with a 6 PM dinner, 7PM bath, “spa” time afterwards, fresh pajamas and a final nursing with Wife. And finally, Nurse Rita stressed that bedtime is sleep time – “no goo-goo, gaa-gaa stuff” at bedtime. No matter how badly you want to stand at the crib and coo –let ‘em go to sleep. Compadre has also weighed in on the subject. His background is in early childhood development and he spends his days making Chicago’s pre-school situation better. He stressed that young children respond to structure. I’m fairly certain he said they need it. So we try to stick to the routine, the schedule. And so far Sweetie has followed the example, despite the occasional fight. Of course we have consulted the interwebs and read multiple books as well. Most also suggested some type of sleep schedule and sleep routine. So we have kept it up and modified Sweetie has grown. The naps have shifted every couple of months. And we stopped the nursing/final bottle at 1 year so now Sweetie just has a final cuddle with Wife before going down. The schedule continues to develop with Sweetie’s needs. So a sleep schedule has worked for us. Nurse Rita’s advice stuck with us from the beginning and our resolve is strengthened by what we have read and by other peoples’ input. And that’s been important for helping us stick with it. Over the past 13 months we have left family events early, we have shut down the house with guests still visiting; we have bowed out of some social events. So in some ways we have compromised our schedules to keep Sweetie on hers. And I guess that sums up parenting as a whole; the sleep schedule is just one specific example. I know some people think that any sort of “schedule” is rigid, especially one without “goo-goo, gaa-gaa” time. But when I wake up on Saturday morning after a solid eight hours of sleep, I’m okay with that.